My mom and I went on an adventure today. And then, we found the real treasure of the day. It was especially fun because we didn't even know that we were going to stumble upon it. It is called Objects, and it is located at 116 S. Main in Eureka, IL. Love the unique handmade items. 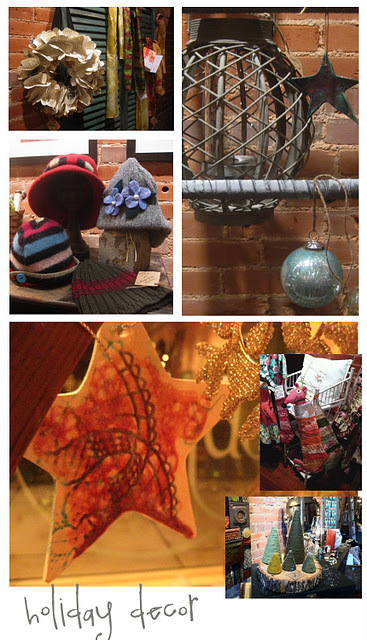 Love that the items are made by over 25 local artists. Love the jewelry, hats, clothing, decor, quilts, and wall art. Love the layout of the store. Love the courteous lady working this afternoon. Love that she offered us hot wassail. Love that ALL of the owner's profits go to support an orphanage in Peru. Here's the link to their blog. And here's an article from the Woodford County Journal that tells their story. Katie! I LOVE that place too! I am glad you were able to explore and enjoy! I thought of you when I was there, Kayla! I hoped that you had a chance to see it :) I loved it!